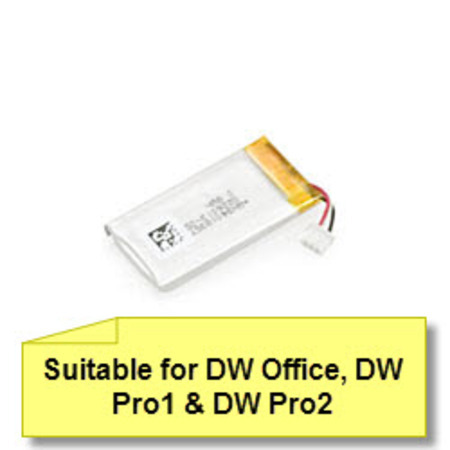 Genuine Replacement Battery for Sennheiser DW Office and DW Pro wireless headsets. Beware don't buy cheap cloned batteries. There have been instances of non-genuine batteries over-heating and catching FIRE. A purchaser of a cloned version of this battery has commented "This battery lasted 11 weeks. The battery that came with the headset lasted for over 1 year. This is a lower power version and doesn't work well at all. " A new battery should last for 8 hours in wideband sound mode and 12 hours in narrowband sound mode, before requiring recharging. For best performance, it is recommended that these batteries be replaced every 2 years. Or, as soon if you find your headset running out of charge too quickly.